There is a growing focus on gaming monitors and manufacturers such as Acer are putting effort into developing tailor made monitors that meet all the needs of a demanding FallOut 4 player. It used to be the case that we’d all be happy with a 24″ widescreen running at 1080p, but recently we have seen a new wave of technologies and concentrated effort in the game screen market. The Acer XR Predator XR341CK is a 34″ 21:9 curved screen monitor that combines FreeSync, fast response times with an IPS panel. Right now this is a luxury item at a premium price, you’ll need a decent graphics card to get the most out of it and a large desk to seat it on! There is a G-Sync version of this monitor which, as you might expect, is a little more expensive – that’s the price you pay for running with Nvidia’s proprietary technology. This is a premium priced monitor so you would be forgiven for expecting a top quality product. And thankfully the monitor design is attractive, sleek, and sturdy. There is a potential issue that is worth highlighting, the stand sits on three points and each needs to be well positioned on your desk, as a result you’ll find the monitor sits relatively far forward on your desk. Given the size of this screen you’ll likely need a deep desk for it to sit in a comfortable position. Arguably this is an issue with all larger monitors, after a certain point there is limit to how much screen you can comfortably see when sat at your desk. 34″ is about the limit in my opinion, it starts to get difficult to see in game events that you need to react to in your peripheral vision. This is very subjective though and something most gamers need to experience for themselves. The screen curvature should help in this respect. The monitor has smooth tilt and height adjustments although both require some effort to move, probably just as well as this is not a light screen by any measure. It has an anti-glare coating which does the job without leaving the screen too grainy. You also get a strip of blue LEDs across the bottom to provide that all important ambient glow – no serious battle station would be seen without one! 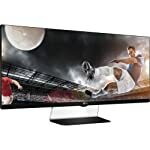 The monitor comes with all the modern connectivity options but note you’ll need to use the DisplayPort socket if you wish to take advantage of the FreeSync adaptive syncronisation technology. As expected for an IPS based panel, colour reproduction is impressive out of the box, and as always, can be tweaked further if required. Wide viewing angles are important here due to the great width of the monitor. You wouldn’t want to observe the colour degradation sometimes seen on TN panels when looking over at the edges of the screen. The XR341CK has impressive latency ratings which is good news for gamers and also better than expected power usage given its size and resolution. 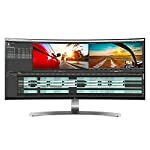 The problem with running at high resolutions like 3440 x 1440 is that you need a lot of bandwidth to carry all the information from your graphics card to your monitor, so whilst this is a game orientated monitor, the refresh rate is limited. On the plus side, they do allow you to hit 75Hz which is actually around 20% higher. And, as the former owner of a 75Hz monitor I can confirm that this was a noticeable improvement – to me at least. In fact, many argue that the biggest gains are seen at this point with diminishing returns when going from 120Hz and higher. The Acer XR Predator is not just a gaming monitor though, the screen works well when running Windows and the 34″ size is big enough to avoid the need for any scaling. You should find apps work great and the setup gives you a dual monitor type experience without an annoying gap down the middle. The XR341CK stands out as one of the best gaming monitors on the market right now, but… it does not come cheap. We give the Acer XR Predator XR341CK a 5 out of 5 rating. Want to know what existing owners of the monitor think? You can read real user reviews here. Should I buy the Acer XR Predator XR341CK? The Acer Predator XR341CK is a premium gaming monitor, that much is true. If you are looking for the best on offer right now then this ticks all the right boxes. 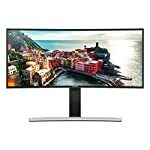 Here's hoping the price of these beautiful screen drops in the future and we'll all be able to have one of these sitting on our desk. If you are lucky enough to buy one, do let us know what you think of it. If you are having some doubts about this purchase then why not read some real owner reviews and see what other buyers think. Welcome to the Acer XR Predator XR341CK FAQ. This section attempts to answer common questions you may have, please get in touch if you have any more queries or if you think our answers need updating. 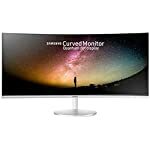 Is there a G-Sync version of this monitor? Yes there is, check out the Acer Predator X34 for a G-Sync enabled version of this 34″ curved screen. Is this just for games? Not at all, the IPS panel gives great colour reproduction which makes it ideal for all kinds of apps. The size and resolution ensure you will have plenty of working space. It is quite possible to replace a dual monitor setup with one of these.